Hi-tech cooperation between China and EU has huge potentials, and dialogues and mutual trust are keys to forming closer digital ties between the two sides, Luigi Gambardella, the president of the ChinaEU business association, said. “In ancient times, countries competed for land. Today, the new ‘land’ is technology,” said Gambardella in an interview with China Daily website during the fifth annual conference of the Taihu World Cultural Forum. 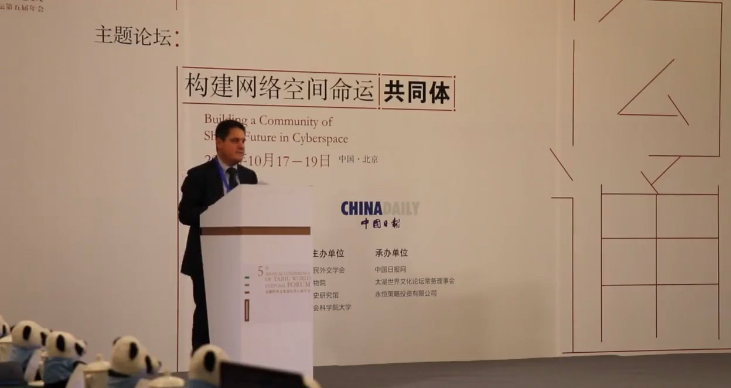 Gambardella delivers a keynote speech at a sub-forum on cyberspace of the fifth annual conference of the Taihu World Cultural Forum in Beijing. A business leader in the telecommunication industry, Gambardella is dedicated to bridging relations between China and Europe in the tech sector. China successfully launched the twin Beidou-3 satellite this September, contributing to the digital Silk Road initiated by China in 2015, which involves helping other countries to build digital infrastructure and develop internet security. Commenting on the digital Silk Road, Gambardella said it has the potential to be a “smart” player in the Belt and Road Initiative, making the BRI initiative more efficient and environment-friendly. The digital links will also connect China, the world’s largest e-commerce market, to other countries involved in the initiative. According to a report by China Academy of Information and Communications Technology in 2018, digital economy accounts for a third of the country’s national GDP. “China is expected to leapfrog US to become the world’s largest digital economy in the future,” Gambardella said. By the early 2018, an estimated 750 million Chinese people, or 97.5 percent of China’s netizens, had access to mobile internet, which enables them to use mobile payment, social media platforms and online government services. Such a high number of highly connected internet user shows great progress and potential of building tech-driven smart cities. While China is up-and-coming in the technology sector, Gambardella said Europe is traditionally a global power in hi-tech fields like robotics and it boasts highly developed manufacturing industries, including vehicle manufacturing. “Between the two, there are great opportunities that we have never had before,” he said. There are precedents where European and Chinese have partnered up. In 2016, Midea took over Kuka, a major German robot manufacturer, and Huawei took up about 24.8 percent of Europe’s market share with a double year-on-year increase in sale. However, Gambardella said the current level of dialogues and cooperation between China and EU is insufficient for deep mutual trust, which, according to him, poses the biggest challenge in the China-EU digital cooperation. The lack of mutual trust could be one of the obstacles hindering further exchanges in some EU member states amid surging security concerns. To promote mutual understanding and trust among countries, efforts are needed from all sectors, including political, business and academic exchanges and joint ventures. According to Gambardella, cultural exchanges are especially essential to resolving misunderstandings and mistrust which are obstacles to a deeper China-EU digital cooperation. “It is for this reason that we need high-level events like the Taihu World Cultural Forum. It brings people together and help we understand what are the differences and reasons behind and, eventually, how we can work together and find solutions,” Gambardella says. A member of the high-level advisory board of Wuzhen’s World Internet Conference, Gambardella also said that the WIC is a successful brand built by China and a wonderful place for dialogues and international cooperation. He expects this year’s conference to see relevant parties work to “jointly build a community of shared future in cyberspace”. A version of this article appears on the China Daily website, please read here.